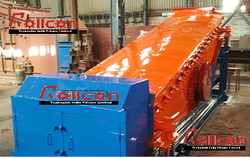 Leading Manufacturer of vibrating screen from Delhi. Vibrating screens are commonly used in the process industries for size segregation of polydisperse particle mixtures. Given the wide range of applications, such screens are available in a variety of designs. Multiple deck screens are used for the grading of the primary mixture into different groups according to size. The primary function of a screen is to pass the fine particles through the screen surface. For any granular material subject to vibration, the fines naturally sink to the bottom while larger particles float to the top. This phenomenon of stratification results in an efficient exposure of fines to the screen surface, and hence enhances the screening process. The vibratory motion, the surface slope angle as well as the geometrical parameters determine the effectiveness of the screen for a particular task.